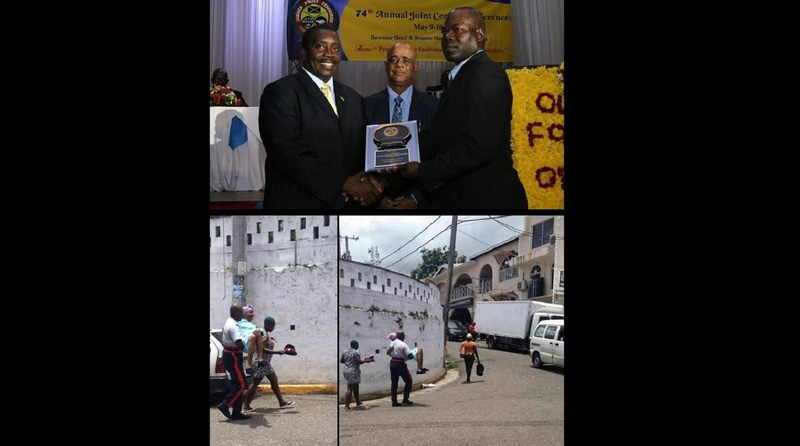 At top, (from left) National Security Minister Robert Montague and Police Commissioner George Quallo present Constable Richard Plummer with an award for his act of kindness in helping an elderly woman who suffered a fall (pictured at bottom). Constable Richard Plummer, who made headlines last weekend when he gave a helping hand to an elderly woman who suffered a fall, has been officially recognized for his act of kindness. Plummer was awarded a plaque in recognition of his “selfless act” at the Jamaica Police Federation Conference on Tuesday. National Security Minister Robert Montague and Police Commissioner George Quallo made the presentation. 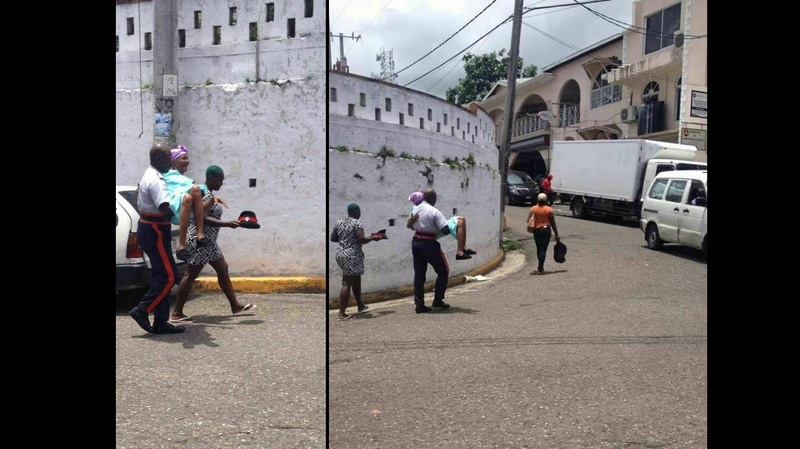 Photos of Plummer carrying the senior citizen in his arms have been shared thousands of times since last Friday, with the cop receiving hundreds of compliments for his action. Among those who lauded Plummer was Prime Minister Andrew Holness, who commended the St Ann’s Bay cop via Facebook. The prime minister wrote: “I must commend Constable #RichardPlummer of the St Ann's Bay Police who gave a helping hand to this elderly citizen who had a fall. “There is #HopeForJamaica when we all are our brothers' keepers,” Holness said. The photo was reportedly captured by entertainer Errol Richards, who said in a Facebook post that the cop was unaware that he was taking a picture. “This officer did not know I saw his act of kindness nor did he know I took this picture. This is another way they protect and serve. Thank you officer for taking care of an elder in need. I salute you with much respect,” Richards said in the caption of the photos.